Tokyo: Hygiene in daily life is crucial for living a healthy life and while technology has been helping maintain hygiene, it needs a lot of effort when it comes to maintaining hygiene, be it bacteria being left on notes from ATM machines or studies suggesting that smartphone screens having more germs than a toilet seat. 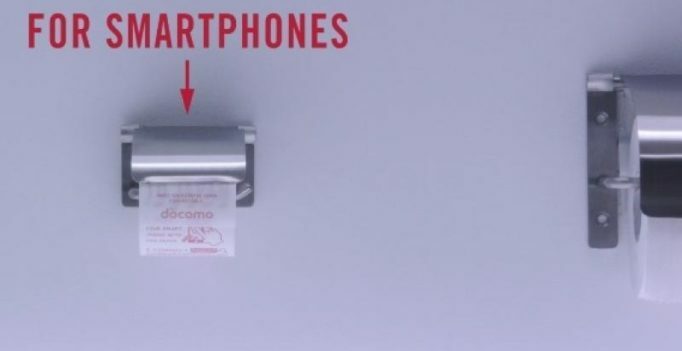 Going by this, a firm in Japan realised the importance of maintaining cleanliness of phones from time to time and for that purpose the telecom giant NTT Docomo has installed special toilet paper rolls at Narita Airport in Tokyo, which are specifically meant for wiping smartphones clean. The rolls are put inside washrooms right beside the dispenser so that people remember to clean their smartphones just as they wash their hands, since they take phones inside the washroom as well. The papers also have information about Docomo’s WiFi services and travel information printed on them.